Ford Focus Estate Performance, Engine, Ride, Handling | What Car? We’ve still to try the entry-level 1.0-litre petrol engine, which produces 84bhp and is badged Ecoboost 85. The signs aren’t encouraging, though; even the 99bhp 1.0-litre (Ecoboost 100) is rather slow in the hatchback Focus, let alone the heavier estate. Instead, we recommend at least the 123bhp 1.0-litre (Ecoboost 125). Okay, it isn’t frisky enough to wake up your adrenal glands but, as long as you don’t let the revs fall much below 2000rpm, it responds eagerly enough whenever you put your foot down. 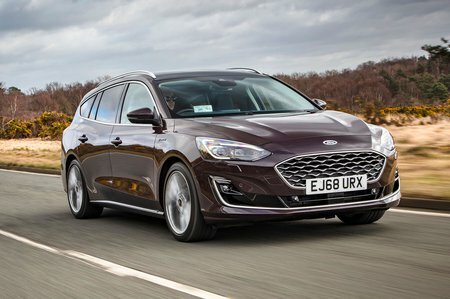 However, if you regularly carry lots of people or simply want more oomph, then for the Focus Estate the stronger 1.5 Ecoboost 150 is our pick of the range. Meanwhile, if you're a diesel fan, the 118bhp 1.5-litre (Ecoblue 120) represents the sweet spot of the diesel range, offering a good spread of shove once you get past its initial low-end turbo lag. The 148bhp 2.0-litre version (Ecoblue 150) doesn't feel that much faster, especially if you order it with the optional eight-speed automatic gearbox. In fact, whichever engine you go for, the auto 'box takes the edge off its performance. 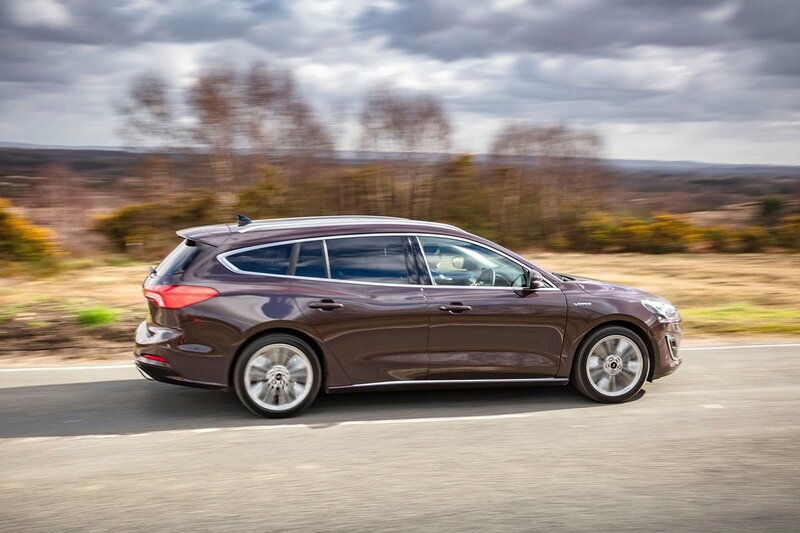 The Focus Estate gets a more complex suspension set-up than the basic hatchback and pricier versions provide the option of adaptive dampers, should you want to the opportunity to fine tune your ride further. Essentially, it’s a fine-riding car, no matter which version you buy; it sits somewhere between the ultra-supple Golf Estate and occasionally lumpy Octavia Estate in the comfort stakes. There are also sportier ST-Line and ST-Line X trims that have a lower, stiffer set-up. While neither are boneshakers, you do notice their greater firmness over potholes and corrugated surfaces, especially in the ST-Line X with its bigger 18in wheels. The Active and Active X wannabe-SUV versions get a raised ride height and chunkier tyres, but those hoping for extra comfort may be disappointed; their overall ride isn’t massively smoother, still showing a tendency to pick up on surface imperfections. We haven’t yet tried the adaptive dampers, but our impression of the standard car is that it's good enough to probably render this fairly pricey option unnecessary. 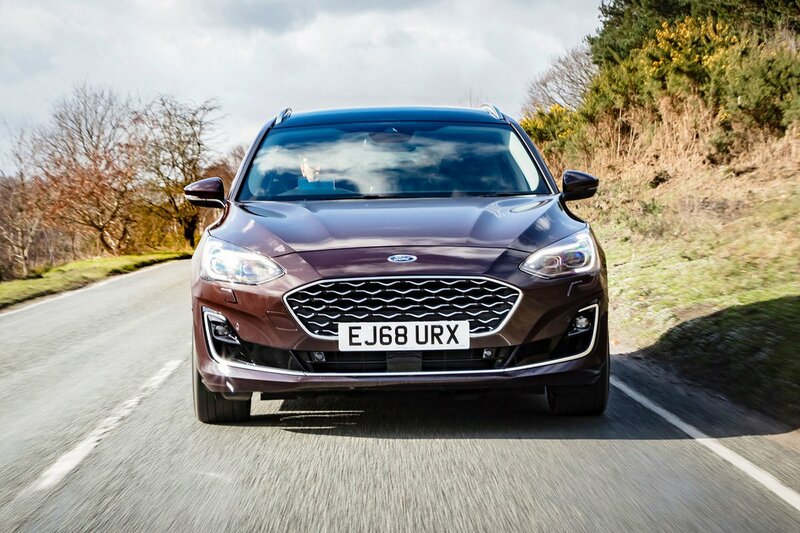 Regardless of which options you go for, choose a Focus Estate and you’re guaranteed a car that handles deftly; the only question is how deftly. Certainly, the stiffer ST-Line set-ups control body lean better in corners, making them the most agile trims in the range. Honestly, though, every Focus flows with elegant balance along roads strewn with challenging cambers, contours and crests. Taller Active models lean a little more, but are still fine handling machines as well. Add in steering that's light in town yet precise enough for you to guide the car accurately along meandering roads, and handling is an area where the Focus Estate squarely beats its all of its price rivals. The Focus's three-cylinder petrol engines thrum away distinctively in the background, even at low revs, but never in an annoying fashion. The 1.5 Ecoblue 120 diesel is quite a bit grumblier at low revs, and booms when revved hard, but is still smoother than an Octavia 1.6 TDI and generates less vibration. The 2.0 Ecoblue 150 is slightly quieter than the 1.5. True, there’s some flutter from around the Focus's door mirrors on the motorway, and the estate model lets in more road noise than the Focus hatchback due to its open boot area, but travelling at speed remains a more civilised experience than you'll have in the Octavia. Every Focus comes with a sweet-shifting six-speed manual gearbox, with an optional eight-speed automatic available throughout most of the range. The auto 'box, especially hooked up to the diesels, isn't very good. It's jerky when you're manoeuvring into parking spaces and thuds as you take up drive in traffic. We’d absolutely recommend the manual 'box unless you really need an auto.